Sometimes it’s six in the morning just as the sun’s coming up, and other days it’s midnight or later, and quite frequently, random intervals in between. My energetic dog, Scout, and I take lots of walks around our neighborhood. She likes sniffing, scouting, and, well, “sprinkling,” and I like strolling in the sunshine, or under the stars, and noticing the changing details of the houses, trees, and yards in our corner of downtown Santa Barbara. On one of our walks a couple of weeks ago, I was excited to see a for-sale sign in front of a big Victorian house just a block away from ours. Scout and I altered our walking routes so that we went past 315 West Victoria Street even more often than usual. I had noticed the broad, bow-fronted façade and big bay window of this home on previous walks, and now that I was paying closer attention, its pretty trees and circular driveway caught my attention, too. The next Saturday, without Scout, I visited 315 West Victoria Street during an open house and was charmed by the interior of this big, open, five-bedroom, five-bath home. It feels like an elegant farmhouse. From the inside, the bay window is the centerpiece of a gorgeous living room, and there are plenty of period touches, such as hardwood floors and black-and-white patterned tile work in the kitchen. It has some surprises, too, including a huge basement. Then this week when we stalked by, I mean walked by, I noticed a new development on the block: another for-sale sign on another house, directly across the street. The home at 314 West Victoria Street is an adorable Folk Victorian with white wood siding, curlicue gingerbread detailing, and a classic white-railed porch extending along the front of the house. It has tall windows and carved wood columns, and also sports two front doors. While its neighbor across the street is elegant, this home is unabashedly adorable. Built in the 1890s, its two-bedroom, two-bath footprint is more characteristic of this era. I was excited to see the inside of this cutie, as well, so I could continue my fantasy comparison-shopping of these two neighboring listings. When I inquired about 314 West Victoria Street, however, I learned there has been so much immediate interest from potential buyers that there might not be the opportunity for an open house. It’s not surprising, really. If one could live anywhere at all, being within walking distance of the historic theater district, the beach, and the courthouse is a pretty great choice. Both of these beautiful homes offer charms of their own, as well as this coveted location. Just watch out for that curious lady and her little dog walking past and eyeing your house at all hours of the day and night. 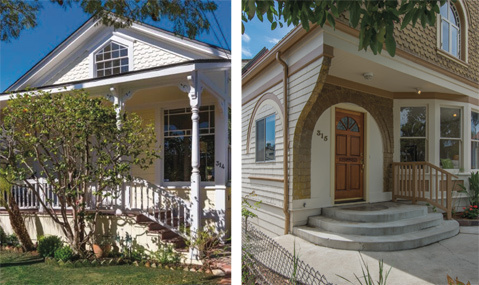 The homes at 314 and 315 West Victoria Street are both currently for sale in Santa Barbara: 314 West Victoria is listed by David Kim of Village Properties Realtors. Reach David at (805) 296-0662. The property at 315 West Victoria Street is listed by The Venturelli Group of Coldwell Banker Real Estate. Reach Gabe or Bruce Venturelli at (805) 680-5141 or (805) 448-3644.